It’s the year’s most highly anticipated award series. 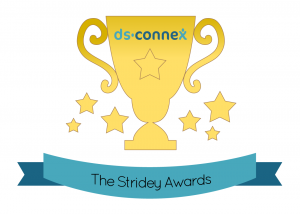 No, it’s not the GRAMMY Awards or the Oscars; it’s the First Annual Stridey Awards, brought to you by ds-connex! These “unofficial” official awards highlight signature aspects of the 2015 Down syndrome walk season that are vital to walk fundraising success and the ability to grow an even stronger Down syndrome community. Throughout the month of January, we have been announcing the winners on our Facebook page. Check out the full list of awards and winners below. Congratulations to all! 1. Cha-Ching Stridey – The three walk teams with the highest grossing team fundraiser (recorded in Stride) for their Down syndrome walk. 2. Dressed to Impress Stridey – The five teams with the “unofficial” most creative team t-shirts that we (ds-connex) came across during the 2015 walk season. 3. Early Bird Stridey – The top three Down syndrome organizations who had their Stride sites open the longest. 4. “Go Team!” Stridey – The walk with the highest average funds raised by walk teams. 5. The Notable Name Stridey – The ten walk teams with the most creative & original team names this year. WINNERS: The Attack of Georgezilla!, Macy’s Parade, James & the Giant Peaches, Captain Jack & His Band of Misfits, Wild Goose Chase, Little Beau’s Peeps, William’s Wiggle Worms, We hit the JAKEpot, Believin’ in Ben, & The Big Hug Machine. 6. Social Savvy Stridey – The three Down syndrome organizations whose Facebook saw the largest % growth in 2015 during its partnership with ds-connex. 7. 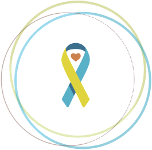 Spread the Word Stridey – The Down syndrome organizations who had the most usage of the “Share This” button to promote the walk site on social media or through email. 8. Storyteller Stridey – Recognition of teams who personalized their team profiles. Photos and a short personalized description of why a team or individual is walking allows them to connect with prospective supporters on another level, increasing the likelihood for support. WINNERS: All teams & individuals who personalized their profiles. A special shout out the following teams who went the extra mile to personalize their profiles in 2015: Erik’s Entourage, Landon’s Luau, & Clay’s Crew (all of the Omaha Buddy Walk®); Kennestone Krew & Team Natey Boy (Atlanta Buddy Walk®); Sibbie’s Superstars (DSNWV Buddy Walk®), and Mille’s Marchers (Columbia Buddy Walk®).